Dallying In The Dirt, Issue #169 --- There are ants in the cauliflower and that's a disaster. I was excited last week because I saw some Asparagus peeking through the mulch and it continued to peek looking for warmth. Tonight we will actually eat the first Asparagus. Only one plant is showing any real growth and it’s at the higher drier end of the garden. I pulled some overwintered Parsnips from the lower end of the garden and it was difficult to release them from what is essentially still mud. Spring is late. The cool season vegetables in the cold frame should have been in the garden a week or more ago but the weather and the reconstruction of the bathroom have prevented that. If I had been able to plant them we could have avoided this year’s first disaster. 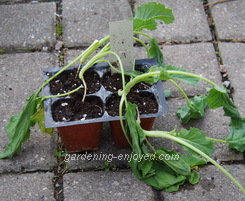 I noticed that some of those vegetables were wilting very quickly and not recovering when watered. I pulled them out of the cold frame yesterday to discover that they were infested with ants that were burrowing through their nice soft soil, eating their roots and then returning to their home in the heated sand underneath. Those plants are now sitting on the path trying to recover and the ants have been attacked with some liquid borax before they can spread farther into that nice warm sand. The plants will finally make the garden today and tomorrow. I need those ants dead so that I can move the Tomato, Canna and other seedlings into that space. The Tuberous Begonias have exploded and are demanding that they get moved into their permanent pots. Lack of space has been holding me back but I must do it today or they will suffer from overcrowding in their starting flat. Each one must now be teased apart from the others and potted up in at least 20 cm (8") pots so they can grow to their full potential. 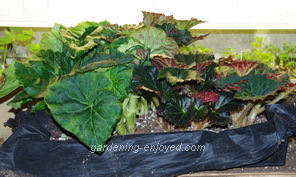 I use terra cotta pots for two reasons. I just like their appearance. They have a wide strong brim that allows me to hang them up with some pot holders that I’ve used since I found them at a garden show. The large tubers that I purchased from Garden Import have been more than worth the little extra money that they cost. There are multiple stems growing from each tuber. The down side is that they must go directly into their large pots as they won’t fit anywhere else. They will be planted with a little of their stem in the soil as they will root from the stem and the top of the tubers, making them more secure in the pot. They will bloom all summer on the posts around the deck, in some fairly deep shade. By midsummer I will start to spray them to keep the mildew from moving in and shortening their season. An exotic spray I discovered that works well is 1 part milk to 9 parts water. This past Tuesday was one of those days that garden writers in our area eagerly anticipate. Loblaws, one of the large grocery chains, do an amazing job with their garden centres. They search the world for new and interesting plants to feature and they put on a media day where we get to see all their new plants and interview the breeders and growers. Then they let us take all the plants home with us to plant into our gardens and see how they perform. After that full disclosure, let me tell you about some of the interesting things that are sitting on my deck trying to keep warm, while they wait for their homes in my garden. There was a slight emphasis on plants that will tolerate shade to fill the huge gap left by the loss of the regular Impatiens. The Impatiens downy mildew has made them quite useless as garden plants. A series of New Guinea Impatiens, Divine, has been developed by Pan American seed featuring bigger and more numerous flowers that will perform in the shade. I have a couple of pots of a lovely purple one and there are several more colours. 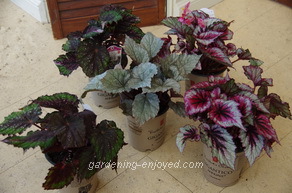 Some new Rex Begonias with fantastic coloured foliage will also do very well in even rather heavy shade. They can come indoors for the winter as well. My front porch steps usually feature bright red Geraniums but this year a new variety, exclusive to Loblaws, will take their place. Crimson Flame is a bright red Geranium with a hot pink edge on the each bloom. It is a Calliope type, a cross between the Zonal and Ivy Geraniums that produces great lush growth with lots of continuous bloom. I’ve grown some Calliope types for the last couple of year and they have performed very well and I’m excited to see this new colour on the front steps. Carol Offers Advice! I'm thinking about your last issue re the red lily bugs. I let gravity do the job. I've found that a bit of soapy water in the cat's empty food can is ideal for shaking/nudging the little devils into it. They don't like soap. Ken Answers! That is also an effective method and spraying them with insecticidal soap also works as long as you actually hit the little devils with it. I just get a certain satisfaction from the crunch when my needle nosed pliers do their thing. I may be a bit weird.